A Memorial in Rich’s honor has been established for Compassion USA, a ministry Rich cared deeply about, so much so he taught music on an Indian Reservation through Compassion. Please call 1-800-334-KIDS and contribute in Rich’s name. He would have liked that very much. Rich and Mitch both won Song Of The Year for “My Deliverer.” David Mullins and Mitch both thanked everyone – Myrrh, Jim Dunning, The Ragamuffins, and all for making it happen. Mitch struggled just a bit to fight back the emotions, but did well. In his usual modesty Mitch thanked Rich. Songwriter of the Year went to Rich Mullins! To leave us his best work before he went to be with the Lord! If you do not have a copy of the “Jesus Record” you need to go out and get it today. For several years Rich had talked about making an album that would unfold the Jesus that we quickly gloss over on our way to church or Christian concerts. He wanted us to see the raw, rough Jesus who had dirty fingernails and who hung out with all the wrong people and loved them just as they were. It was a record, he said, that was “needed,” because for too many of us, Jesus had become domesticated, ordinary, and predictable. And necessary because those who believed Jesus to be otherwise often felt abandoned and alone in their convictions. Such was the nature of Rich’s work: he sought to at once challenge and heal, stir and to comfort, agitate and settle. On September 10, 1997, Rich Mullins sat down in a old, abandoned Church and played Nine songs that were to be part of a record he had affecionately termed “Ten Songs About Jesus”. This was a new project Rich was just starting called “The Jesus Record”. A project Rich said that Was “NEEDED” – For Himself and his friends. JUST NINE SHORT DAYS LATER, Rich left this world and went to meet Jesus, his Savior and Lord. I think when Jesus saw Rich, Jesus said…. “Hey, You hit the Nail on the head with that one! Well done my Good and faithful servant. Come and Rest and know Me as you have always wanted to know Me”. Man I wished I could of seen Rich’s face…….. Glory! Rich recorded the nine songs on a cheap battery-operated cassette recorder. What do you want to bet it was not his own tape recorder. My favorite song is ” That where I am, there you” It is on track 10 on the 2nd CD or the ragamuffin band CD. Why is it my favorite? It is cool how the band and engineers started with the original recording of Rich and then blended the band in with Rich. To me this is a passing of the torch. Rich handing off his Gift to the band. Telling them He is in Heaven looking on and His Father is in control! Also it is a up beat song that rings with Hope and Truth! Thanks Rich for the Going Away Gift! NASHVILLE, Tenn. Contemporary Christian music veteran Rich Mullins, 41, was killed in a car accident Friday, Sept. 19, between 9 and 10 p.m. on Interstate 39 in LaSalle County, Illinois. Also in the accident was Mitch McVicker, 25, who wrote, performed and lived on the Navajo Nation reservation in Window Rock, Ariz., with Mullins. McVicker is presently hospitalized in critical condition. Born Oct. 21, 1955, Mullins, a bachelor, is survived by his mother, Neva, of Richmond, Ind., two older sisters and two younger brothers. At this time the sheriff’s report of the accident is not available, but according to Mullins’ manager, James E. Dunning Jr., Mullins and McVicker were traveling in a Jeep from Chicago to Wichita, Kan. It is believed the car passed a tractor-trailer and the accident occurred in a matter of minutes. The car’s wheels came off the shoulder of the road and the driver lost control of the vehicle. It is not known who was driving. Both Mullins and McVicker were thrown from the car. The tractor-trailer swerved to miss the vehicle and McVicker, but instead hit Mullins in the other lane. Mullins died instantly. Dunning said, on behalf of himself and Gay Quisenberry of Crucible Productions, who managed Mullins for 12 years, “We both thank you for your continued prayers and ask that people respect the privacy and wishes of the family. We also ask that you respect the people of the Navajo Nation and their privacy, as well. “This is both a horrible time and a good time for such a tragic accident. It is horrible because Rich was so young and such a great writer. But, it was a good time in a way, because Rich was at peace with his life. I take great comfort in knowing when I talked with Rich Thursday afternoon before the accident, Rich was experiencing the greatest peace he had known in his life. Mullins recorded nine projects with Reunion Records during his lifetime, including his last recording, Songs. He was nominated for twelve Gospel Music Association Dove Awards throughout his career, and had many #1 radio hits. Mullins was best known for the church standard, “Awesome God,” which in 1989 was voted one of the top three songs of the decade according to the Christian Research Report. Six of his songs have been recorded by other artists, including the well-loved “Sing Your Praise To The Lord,” sung by Amy Grant. But Mullins’ main focus of ministry was to the Native Americans in the southwest. He moved to the Navajo Nation in May of 1995 after completing his B.A. in Music Education from Friends University in Wichita, Kan. There he devoted his life to teaching music to children on the reservation. Alyssa Loukota, U.S.A. ministry marketing and communications director for Compassion International, worked closely with Mullins during the past nine years. “It was Rich Mullins’ vision, in his words, to bring Christ to the Native American reservation,” she said. Loukota also said that Compassion International would covet prayers for the Mullins family, the family of Mitch McVicker and McVicker, who remains hospitalized. Both the Mullins and McVicker families have asked that flowers not be sent. Cards to either family may be sent to Kid Brothers of St. Frank, P.O. Box 11526, Wichita, Kan., 67202. The Mullins family has asked that any memorial gifts be given to Compassion International, c/o Rich Mullins Memorial Fund, Compassion International, P.O. Box 7000, Colorado Springs, CO, 80933. A memorial service will be held in Nashville at 10 a.m. Friday, Sept. 26, at Christ Presbyterian Church, 2323 Old Hickory Blvd. Also, a public service will be held in Wichita, Kan., at 7 p.m. Saturday, Sept. 27, at Henry Levitt Arena on the campus of Wichita State University. For more information about this service, please call 316-262-7159. For historical information on Rich Mullins’ career with Reunion Records, contact Matt Williams, Reunion Records, 615-320-9200. Christian singer Rich Mullins dies in car crash. 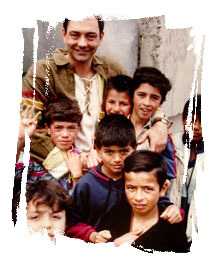 Rich Mullins never thought of himself as famous or talented, and never cared about being rich. What he cared about was serving God and serving others –a message of joy that resonates throughout the contemporary Christian music he wrote and recorded. A former Wichitan and a graduate of Friends University, Mullins, 41, was killed Friday night in an automobile accident in Illinois. Mullins and a friend, Marshall McVicker, 24, were on their way from Chicago to Wichita for a performance Saturday night at Lawrence-Dumont Stadium. The concert was a benefit for a youth ministries organization of the United Methodist Church. The accident happened shortly before 10 p.m. Friday on southbound Interstate 39 in north-central Illinois, near Peoria. The Jeep in which the two men were riding somehow went out of control, and both men, who were not wearing seat belts, were ejected, their bodies landing about 12 yards apart in the southbound lanes. Which of them was driving is not known. A tractor-trailer also traveling south approached the accident shortly after it happened and swerved to avoid the Jeep in the middle of the lanes, said Illinois Highway Patrol Sgt. Gregory Jacobsen. The rig then struck Mullins, who died instantly. McVicker, a Topeka native, suffered massive head injuries and was taken by helicopter to a Peoria hospital, where his condition remained critical late Saturday. Police have found no motorists who witnessed the accident and are still investigating. A bachelor, Mullins is survived by his mother Neva, of Richmond, Ind., two older sisters and two younger brothers. Funeral arrangements are pending. On his mother’s side of the family, Mullins was a “birthright Quaker” born and raised in Richmond, whose faith and beliefs were also shaped by the Independent Christian Church, the Methodist church and a year of religious instruction in the Roman Catholic church. “His great-grandma, who was very influential, taught him hymns when he was very young and he wrote his first song on the piano, when he was 4,” said Kathy Sprinkle of Wichita, a friend of Mullins. Mullins attended Cincinnati Bible College, where his close friends included Sprinkle and Sam Howard, the son of a minister in Wichita. Mullins moved to Wichita in the late 1980s to be a part of the Rev. Maurice Howard’s congregation at Central Christian Church. Mullins had recorded nine albums and had more than 50 hit records in his career, which began in the early 1980s. While still a student in Cincinnati, Mullins was offered a recording contract, and his first album caught the attention of another contemporary Christian recording artist, Amy Grant. A song he wrote, “Sing Your Praise to the Lord,” became one of Grant’s biggest hits. Mullins had been nominated many times for Dove Awards, Christian contemporary music’s equivalent of the Grammy Awards. He was considered a “core artist” in contemporary Christian radio, someone whose songs become the pillars around which other artists’ songs are programmed. His best-known song, “Awesome God,” is a modern standard in many Christian churches and is especially popular with young people. Yet, the soft-spoken Mullins was known as a true paradox — a talented, self-effacing man who refused to let the attention or accolades of the music industry, or his fans, go to his head. Between writing, recording and touring, Mullins completed a degree in 1995 from Friends University in music education. After graduating, he moved to the Navajo reservation near Window Rock, Ariz., teaching music to children on the reservation. “The hope was that he could organize a choir that might go on the road with him, to expose them to life outside the reservation,” Dunning said. Mullins had recently completed a musical, “Canticle of the Plains,” an allegory on the life of St. Francis of Assisi, written as if the advocate of poverty, chastity and obedience were a post-Civil War Kansas cowboy. McVicker, who sang the main part, had been recording in Chicago with Mullins’ help. A song from that musical, “Heaven is Waiting,” recently hit the Top 40 on the Christian music charts. Almost 2,000 people were expected to attend Mullins’ concert Saturday night, said Kathy Kruger Noble, associate director of communications for the Kansas West Conference of the United Methodist Church. The concert was to close a day of workshops and worship for young people, held Saturday at East Heights United Methodist Church. This website is hosted by GH1 Web Hosting, Inc. They have very good Ministry and Church rates. Copyright Mission Trips LLC. All Rights Reserved.